This is the sort of gig that looks promising on paper: three respected music veterans, each one as ostensibly integral to the lineup as the others, all of them playing together on a set of some mutually-loved old favorites (classic soul and R&B covers, mostly) while sprinkling in a few of their respective radio hits along the way. As is often the case with these things, though, all three artists on the bill aren’t all playing at the same level, with the same spark or apparent interest. In other words, someone usually packs more of a punch than the rest. On the just-released DVD (and Blu-ray), The Dukes of September: Live at Lincoln Center, which captures a performance by Boz Scaggs, Donald Fagen, and Michael McDonald in November 2012, it’s Scaggs who reigns supreme, connecting with the crowd through the sheer passion of his musicianship while delivering showstopper after showstopper with soulful, unassuming command. The hits (“Lowdown,” “Miss Sun,” “Lido Shuffle”) sound fresh and funky; the covers (“Willie Dixon’s “The Same Thing,” Teddy Pendergrass’ “Love T.K.O.”) sound inspired. Point blank, Scaggs knows his way around a groove, and his quiet confidence enthralls the audience at every opportunity. That’s not to suggest nobody else brought anything to the party. Fagen, in particular, is spirited throughout, whether in taking a turn on the Isley Brothers classic “Who’s That Lady” or in satisfying the Steely Dan prerequisite with hits (“Peg,” “Hey Nineteen,” “Reelin’ in the Years”) and even a deep cut (“Pretzel Logic”) to boot. McDonald, however, is another matter. When providing backup to Fagen (much like he did on Steely Dan’s albums of old) he’s fine, but when he takes the lead—huffing and puffing through “What a Fool Believes,” “Takin’ It to the Streets,” and “I Keep Forgettin’”—he too often sounds overwhelmed, out of breath, and just plain tired. Such moments are relatively few, though, and Fagen and Scaggs capably pick up the slack. 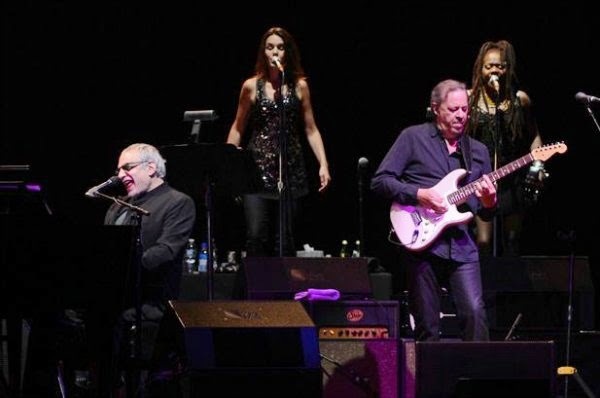 Live at Lincoln Center is sort of a reprisal of the New York Rock and Soul Revue collective of the late ’80s/early ’90s at the Beacon Theatre, which in addition to featuring the same three principals also boasted such artists as soul man Chuck Jackson and the late Phoebe Snow. This 90-minute performance by the Dukes achieves much the same easygoing, collaborative vibe of those shows twenty-five years ago and, at certain inspiring moments, it exceeds expectation.